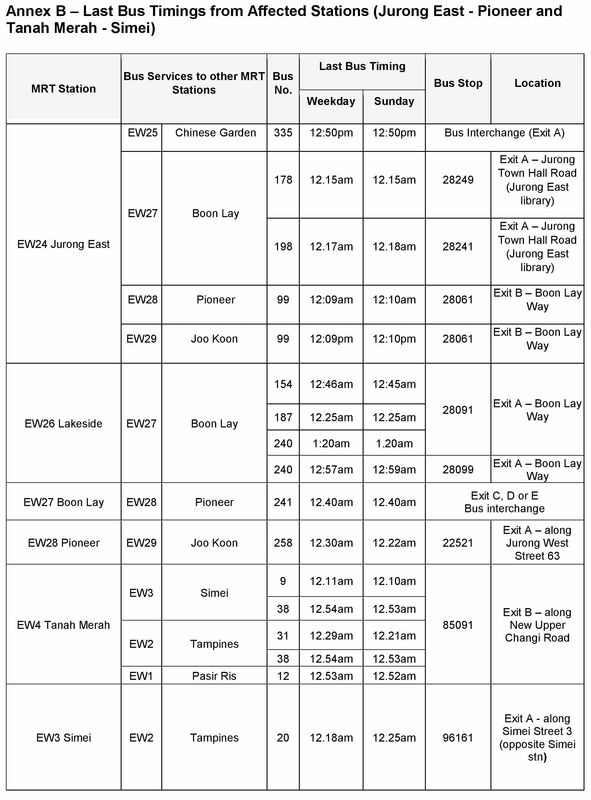 SINGAPORE - To facilitate rail works, train services at some stations on the East-West Line will end up to half an hour earlier, from Sunday night (Feb 14) to end August. Train services between Tanah Merah and Pasir Ris stations and between Joo Koon and Jurong East stations, will end up to half an hour earlier from Sundays to Thursdays, except on the eve of public holidays. In a statement, SMRT said from Sunday (Feb 14) commuters who board the trains after 11.15pm on the East-West Line are advised to plan their journey and consider alternative transport arrangements such as bus services. They can refer to http://journey.smrt.com.sg to help plan their journeys. The early closure is as a result of the second phase of works along the SMRT rail network, involving the replacement of sleepers, or structures which hold the tracks in place. Timber sleepers would be changed to concrete ones. SMRT intends to complete the works by 2017. The first phase, affecting stations between Bugis and Tanah Merah, started in November 2015. SMRT has completed 26 per cent of sleeper replacement works along the East-West Line. The final phase, affecting stations between Jurong East and Outram Park, should be completed by 2017 as reported earlier. Sleeper replacement work on the North-South Line was completed in April 2015.